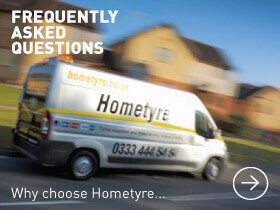 The Hometyre concept and brand was founded by our current group managing director, Andy Lawrence back in early 2003. With a passion for delivering the highest level of customer service and experience, Andy recognised a shortcoming and therefore opportunity within the sector. At the time, there was no true retail mobile tyre offering for motorists in the UK. Replacement or repair of tyres meant a visit to a tyre shop or fast fit centre. The style, branding and ethos put in place in 2003 have been carried forward to today where coverage takes us as far north as Edinburgh and as far south as Brighton. We are absolutely committed to serving our customers' needs and providing exceptional levels of service at all times. This isn't just about convenient tyre fitting either. We want to offer you a fully rounded service which you'll love. As a consumer, we know you have a vast choice of outlets from which to purchase many of the same products that we supply. Rather than providing just another old style fixed site tyre outlet, Hometyre was created and designed to provide our customers with something different. Working only with the highest calibre franchised partners, our network continues to grow providing the highest levels of service. Members of the network are owner-operators who truly value your business and try to exceed your expectations at all times. Hardly anyone relishes the thought of spending money on tyres - we know that! With this in mind, we understand that taking the 'fitting centre' to our customers would remove that additional burden of wasted time, hassle and inconvenience. Our service vehicles are probably the best equipped and liveried in the UK and can easily handle up to 24 inch alloy wheel/tyre combinations and almost all 'run on flat' type tyres. What's more, we recognise that a fundamental part of tyre maintenance is the proper alignment of your wheels. Our service vehicles and technicians are fully trained to check, advise and realign your vehicle fully - both front AND rear wheel adjustment. After all, why enjoy the benefit of a mobile tyre service if you then have to visit a garage to stop them wearing out prematurely!? We have unique, purpose built electronic and web based systems to ensure your purchase runs smoothly from selecting and purchasing your products right through to fitting. Invoicing is all carried out electronically and all vehicles are live tracked in order to keep you informed of any issues or delays. As a business, naturally we must remain profitable to continue our aspirations of growth. We monitor our pricing and that of our competitors to ensure that you will choose to use us again and again. Reaching new customers is difficult for any business - probably more so within the automotive repair industry. The repeat business we receive from our customers is exceptional, and goes a long way to proving that we're doing it right! We hope you'll be next to give us a try. We're confident you'll find the process and experience both straightforward and a real benefit. At Hometyre our aim is to deliver a unique customer service experience but at down to earth prices. We remove the need to visit a tyre depot, saving time, stress and general inconvenience. Not only that but with reliability and professionalism from start to finish, our service is one of quality and one which we truly hope you will want to use again and again and recommend to family and friends. Our state of the art service vehicles allow us to deal with all of your tyre needs, including tyre repair, tyre replacement, wheel re-alignment, wheel balancing and even locking wheel nut removal! We get on with the hard work whilst you get on with whatever you need to be doing - be it at home or at your place of work. We can handle any type of vehicle from the family car to light commercials. Whether you drive a classic sports car or a 4x4 we can supply and fit the right tyres at the right price - we can even make sure your caravan or trailer is well supported too. Perhaps the most surprising fact about Hometyre is that this premium service won't cost you any more than if you had to make all that effort yourself! We don't charge for call-outs and our tyres can often be cheaper than other retailers. So on top of all that convenience we'll be saving you money too! During the winter months it is more important than ever to make sure that your tyres are in good condition. Those four pieces of rubber are the only contact that your vehicle has with the road and even before they reach the legal minimum tread your stopping distances and general safety can be seriously compromised. Police officers can stop any vehicle thought to be driving with defective tyres and the fines and penalty points which can be issued are just another indication of the significance tyres play in overall road safety. With coverage from Edinburgh to Brighton including London, Cambridge, Norwich, Birmingham, Chester, Gatwick and many more, our Hometyre area technicians are very keen to make sure that all the benefits are brought to local people. It could save you a long wait and a large bill elsewhere. It's a win-win situation!! We operate a unique and entirely bespoke logistics system which ensures a smoothness of transaction both for our customers and our area franchisees alike. We are entirely focused on maximum delivery of customer service and totally exceeding expectations. We have working relationships with the MoD, Aston Martin, Bentley and many other high profile organisations and businesses who recognise the quality of our offering and our people! We're looking forward to working for you next too!